Why write on the score? A piano score is a ‘sacred’ book. Many pianists are immensely attached to their scores and feel they couldn’t possibly work from another copy. Once bought and used, scores are associated with memories, emotions, special concerts, recitals and performance venues, and even correspond to particular periods of our lives. They have significance, and are generally covered with markings too. These pencil ‘markings’ often turn them into priceless commodities, and musicians can become disgruntled or morose when they misplace a much-loved music score. I don’t enjoy working from a copy without all my own markings. These annotations will include fingerings (essential for certain passage work and especially for more demanding or lengthy pieces such as studies or concertos), dynamics, pedalling, phrasing, and inspirational or personal markings as well. They are not a necessity, but they do really aid quick, easy study. There are various schools of thoughts on this subject and some musicians write very few details into their scores, but this practice can be very helpful particularly when teaching. Students frequently protest when piano teachers write on their music. I have found this to be the case many times over the years, irrespective of the age of the pupil, and usual comments include; ‘Oh but I want to keep my music clean’ or ‘I find it off-putting to see your scribblings all over my nice clean, crisp score’. 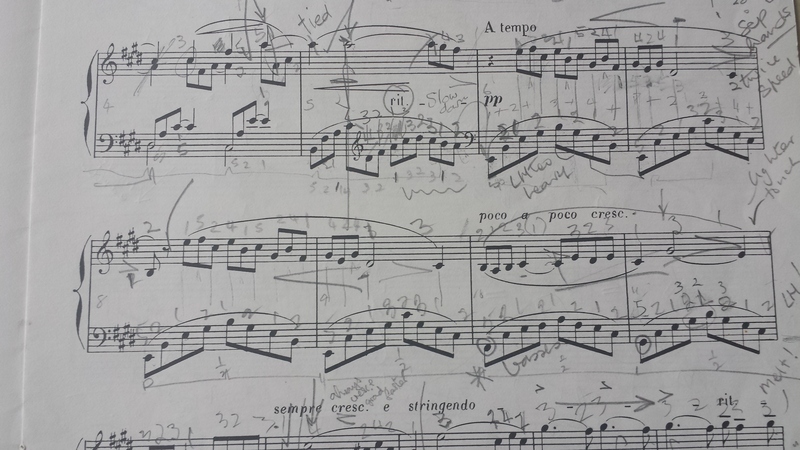 So why is it a good idea to annotate your piano piece? Learning a piece of music is a demanding process and one which very much relies on mental work as well as the more obvious physical activity. With this in mind, anything that makes a complicated process easier should be embraced. Many teachers like to write their student’s weekly lesson notes in a notebook, but I prefer to write directions on their music. This way pupils never forget what work needs to be done for the next lesson. To learn quickly, a piece should be analyzed thoroughly. Some choose to work at their piece in a different musical order to that written (i.e. practising backwards), or focus on complex passages first, so breaking the piece into small sections is advisable. Most pieces follow a specific musical form, so start your study by identifying this form and marking it on the score (look for thematic material, repetitions or similar passages, key changes and the obvious climactic points) then mark them up. This will also help to structure your practice sessions. Most pianists like to write fingerings into a piece. This is crucial because correct fingerings aid smooth playing. Fingerings (numberings which tell a player which finger is needed play each note) all written into a score will help swift learning; every time you return to play the piece you will be reminded of the right fingerings (because they are immediately in your eye line as you read the music) and in time, this will become a permanent habit. Those who have difficulty keeping time might need extra help regarding counting or beating. It’s a good idea to write every beat in every bar, and this is especially important for inexperienced players or beginners. A break down or subdivision of beats in each bar is useful too, along with metronome markings (which are not automatically marked in many scores but need addressing and working out in a lesson). It’s easy to forget practice tempos so this is another good reason to write them down on the music. We all tend to forget details as we practice. Whether dynamics, pedalling or phrasing (especially phrasing), so highlighting these details is a great idea. Again, this way, they become much more noticeable when reading the score. Whilst we must observe a composer’s original markings, sometimes ‘extra’ reminders are necessary. These can include accentuation (it’s easy to ignore a sforzando, but when it is circled in pencil it is that much harder to forget! ), articulation, or any number of musical directions. Small children especially benefit from extra score markings. They often like to draw little pictures at the side of their pieces and adults will occasionally write inspirational reminders helping conjure suitable images or atmospheres for particular works. I write my own signs on scores. A pair of spectacles may signal a passage where I need to pay attention to another musician’s part when playing chamber music or accompanying. A little ‘cloud’ may signify an area where I need to think about a passage in a certain way, or maybe I just need allow some breathing space in the music. These are all commonplace amongst musicians. Score markings are not a necessity but they do make learning and practising that much better and more convenient so surely that has to be a good thing? After all, providing you write in pencil, you can always rub out all the markings if you feel the need to own a puritanical immaculate copy. In today’s blog I am continuing my series on British female pianists and teachers. Fanny Davies was born in Guernsey in 1861 moving to Birmingham where she gave her first performance at the age of 6. She studied privately in Birmingham, then at the Leipzig Conservatory under Carl Reinecke and Oscar Paul. She also studied with Clara Schumann in Frankfurt. Fanny was an extremely successful concert pianist and was considered to be the successor to Arabella Goddard though her playing was nothing like Goddard’s in style or technique. Her concert career began with the Saturday and Monday popular concerts in 1885. Then she performed with the Philharmonic in 1886; the Gewandhaus, Leipzig, 1888; Rome, 1889; Beethoven Festival at Bonn, 1893; Vienna Philharmonic, 1895; Milan, 1895 and 1904; Paris, 1902, 1904 and 1905; Netherlands, 1920 and 1921; Prague, 1920 and 1922; and Spain 1923. Davies was frequently engaged by the Royal Philharmonic Society, making her last appearance in its Society programme on 15 November 1915 under the baton of Thomas Beecham in Mozart’s G major Concerto, K. 453. She had appeared in a Mozart concerto at Beecham’s London debut at the Bechstein (Wigmore) Hall on 5 June 1905. Fanny was the first pianist to give a recital in Westminster Abbey. Her playing has been admired by many for its lyrical projection, warmth and clarity of inner lines and musicianly authority. George Bernard Shaw was not a great admirer, and in 1891 described her as a ‘wild young woman’. In May 1892, after a performance of Beethoven’s Choral Fantasia, he wrote: ‘To those who cannot understand how anybody could touch a note of that melody without emotion, her willing, affable, slap-dash treatment of it was a wonder’. But a year later, at her Crystal Palace performance of the Chopin F minor concerto, he was warming to her, calling it ‘the most successful feat of interpretation and execution I have ever heard her achieve’. Harold C. Schonberg observed, ‘behind her neat, controlled, tasteful playing one can see the specter of Clara…….she embodied in a remarkable degree the unique qualities of the romantic school of which Clara Schumann was admittedly the most spontaneous and finished exponent’. Fanny Davies loved to play chamber music, working often in a piano trio with Joseph Joachim. In 1892 she appeared with Richard Mühlfeld and Robert Hausmann in the first London performances of the Brahms Clarinet Trio in A minor, Op. 114. She also gave the first London performance of Brahm’s D minor Violin Sonata, also with Joachim. She was accompanist for lieder recitals given in 1894–6 by the baritone David Bispham, in Schumann and Brahms (including the Op. 112 Liebeslieder). Davies gave the premiere performance of Edward Elgar’s Concert Allegro, Op. 46, in 1901. The piece was written only after constant requests from her for a new piece, and was dedicated to her. Fanny Davies’ success had a great influence on other female pianists; she was professor of piano at the Royal College of Music and gave much encouragement to students in England and on the continent. She also helped to ‘create among the general mass of amateurs a taste for pianoforte playing of a more warm-blooded type than had hitherto satisfied them’, wrote Herman Klein. 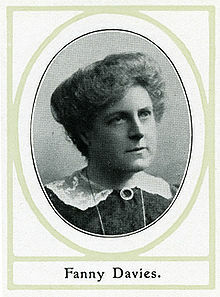 Davies wrote articles and lectured widely on music (many of these papers and articles are in the RCM archives) and she died in 1934.